Good news arrives from the USA overnight as Trinity Yachts announces a new order by repeat clients for a 59-metre superyacht. ABS classed and MCA compliant, this new all-aluminium superyacht is known as hull number T062. She's designed by Geoff van Aller, the in-house naval architect, with significant input from the owners. The interior designer is not disclosed for the moment, but he already created interiors for the owners' previous yachts. T062 will accommodate 12 guests in six cabins with crew quarters for fourteen in seven cabins. The owners stipulated a limited draft (2.4m) for cruising in the Bahamas and good performance. Powered by twin 3,386hp Caterpillar 3516C engines, T062 will achieve a top speed of 19 knots and a range of 4,000 nautical miles at 10 knots. Special features also include an air conditioned main aft deck, a sundeck divided by sliding doors, and a stern garage for the tender doubling as a beach club when the transom is open. 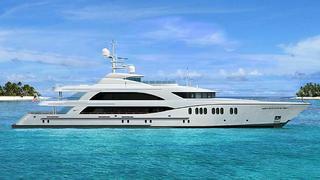 The Trinity Yachts T062 is scheduled to be delivered to her experienced owners in 2015.